-Zoom into vent(1S), then zoom into metal box (1T): urse NAIL CLIPPERS on cables(1U). - Examine the diary(1V); use DIARY KEY on the keyhole(1W) to activate mini-game. - Play mini-game; Move the moons(h01 - h08) along the paths until you set their proper arrangement. 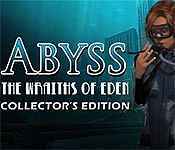 Sign-up to get informed when the Abyss series has new game released with BD Studio Games' FREE bi-weekly newsletter.